That's me tooting my own horn- which I try not to do too often, but I can't help myself (sorry!). 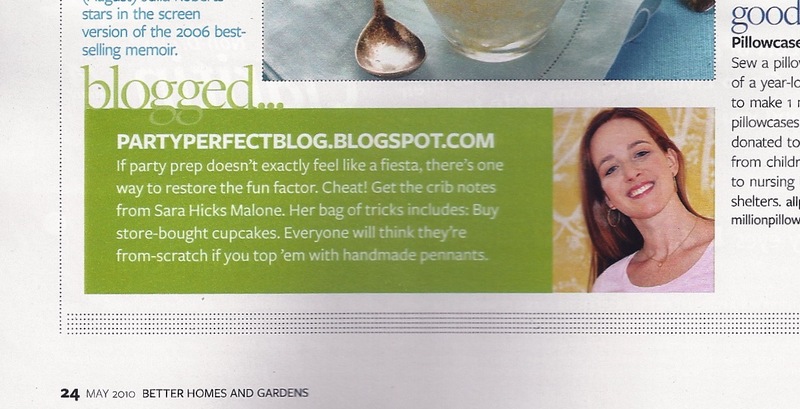 While I was doing a 9:30 p.m. grocery run on Friday night, I spotted the May issue of Better Homes and Gardens. On page 24, there it is...a shout-out to Party Perfect- hooray! Thanks to Miranda for putting up with me (I'm not the best interviewee as I tend to go off-point and then forget what I was saying), and to BH&G for choosing little ol' me as one of their faves! I'm so incredibly honored. And apologies for my tilt-y head, not quite sure what I was doing with that one. How fun for you! That is so exciting! Toot away! That is so exciting. Congratulations. that's awesome! congrats to you. what a highlight to a grocery trip - did you show the cashier? You deserve it! Way to go! That is sooo awesome for you!! Toot! Toot!! congratulations. I actually just saw it in the mag today! You sure do deserve to toot your horn! Congrats! How fun! Just ran across your ad in BHG and looked you up. You have all right to "Toot" away! Congrats girly! I just saw that this afternoon, and I was so excited for you. Congratulations! Congratulations! You totally deserve it. got my BHG yesterday and i felt like i was looking at a friend in the magazine. i love following your blog and all of the great ideas you collect.